1 of 3 Coat slow cooker with nonstick cooking spray. Combine cauliflower, potatoes, stems from Swiss chard, onion and chickpeas. Stir in oil, salt and pepper. 2 of 3 In a medium bowl, whisk curry paste, warm water and brown sugar. Add to slow cooker along with tomatoes and raisins. Stir to blend. Cover and cook on HIGH for 5 hours or LOW for 7 hours. 3 of 3 Chop Swiss chard leaves or spinach. Add to slow cooker. Re-cover; cook 30 minutes more. Gently stir. 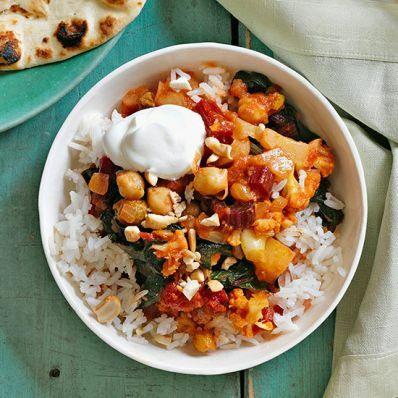 Serve curry over basmati rice. Garnish with cashews and a dollop of yogurt, if using. Per Serving: 1044 mg sodium, 13 g Fat, total, 542 kcal cal., 1 g sat. fat, 0 mg chol., 12 g fiber, 97 g carb., 14 g pro.